Enjoy a relaxing and inspiring cruise on the Romantic Rhine, Europe's longest river. We travel onboard our exclusively chartered ship, visiting iconic and picturesque ports of call, sample incredible cuisine onboard and absorb the local culture as you cruise on Europe's longest river. This escorted tour includes FREE ROUND TRIP AIRFARE FROM ANYWHERE IN THE US,the river cruise, 9 dinners, 6 lunches, 9 breakfasts, luggage handling and 10 nights accommodations. 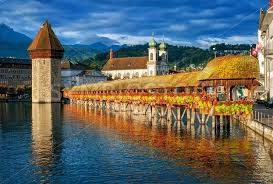 • Shore excursions escorted by local English-speaking guides in Lucerne, Strasbourg, Koblenz, Cochem and Cologne.